Miss Pettigrew Lives for a Day. By Winifred Watson. Illustrations by Mary Thomson. Foreword by Henrietta Twycross-Martin. Persephone Classics, 234 pp., $15, paperback. This sparkling comedy is something rare: an intelligent fairy tale. Henrietta Twycross-Martin rightly compares it to a Fred Astaire movie. But Guinevere Pettigrew hardly resembles the heroines of those films. She’s no gamine Audrey Hepburn, seduced by Astaire’s sophistication, in Funny Face: She’s a virginal 40-year-old curate’s daughter, without family or friends, who gets so little work as a governess that she is facing eviction for nonpayment of rent. Then her employment agency sends her, mistakenly, to the home of a nightclub singer instead of family of untamed children. Over the next 24 hours her life changes in ways that are near-magical yet believable. 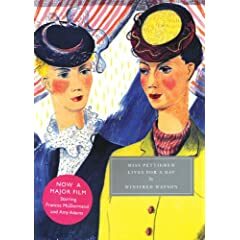 Winifred Watson describes the upheavals on an hour-by-hour basis that invests her novel with a voyeuristic allure-by-proxy: Reading Miss Pettigrew Lives for a Day is like reading a diary kept not by its owner by an amused and lighthearted observer. That structure works partly Guinevere’s character remains solidly drawn through all the changes: She is meek but open-hearted, susceptible to change but not a fool, and free of self-pity yet touchingly grateful for her good fortune. Dazzled as she is, Guinevere helps her new acquaintance sort through romantic entanglements that have elements of a classic bedroom farce. Miss LaFosse repays her by showing her a world of cocktails, evening gowns and men who never knew her as a failed governess. Miss Pettigrew, though sheltered and naïve, never comes across as vapid or ridiculous. Without being stuffy, she has self-respect. All of this alone might set this novel apart from much of the more recent fiction aimed at women. But Miss Pettigrew Lives for a Day also has sparkling repartee, bright scenes of London nightlife, and whimsical pen-and-ink drawings retained from the first edition. In 1001 Books You Must Read Before You Die, Meg Jensen writes aptly that this novel reminds us that “it is never too late to live.” It doesn’t hurt that this book lacks a stereotypical pink cover, either. Best line: “Terrified, aghast, thrilled, Miss Pettigrew stared at the innocent-looking white powder. Drugs, the White Slave trade, wicked dives of iniquity, typified in Miss Pettigrew’s mind by red plush and gilt and men with sinister black moustaches, roamed in wild array through her mind. What dangerous den of vice had she discovered? She must fly before she had lost her virtue. Then her common sense reminded her that no one, now, would care to deprive her of that possession. Recommendation? Manna for book clubs. Smart, funny, short enough that everybody can finish it. Published: 1938 (first edition), 2008 (Persephone Classics edition). Movie link: For more on the 2008 movie version, visit www.imdb.com/title/tt0970468/. Furthermore: Watson’s obituary in the Independent is posted at www.independent.co.uk/news/obituaries/winifred-watson-640426.html. Would any critic write, “Be jealous. Veteran writer Philip Roth has lost the hair, but he’s still got the talent”? Is this a book review or a teaser for an episode of The Bachelorette? This week’s winner involves no hyperbole — the reviewer apparently intends for us to take her words literally. But the quote illustrates a trend that’s just as bad: Critics are using their review space to congratulate novelists for being good-looking or having other traits unrelated to their fiction. Would any critic write, “Be jealous. Veteran writer Philip Roth has lost the hair, but he’s still got the talent”? So why do we so often see equivalent comments in reviews of younger authors’ novels? Gusher Awards for Achievement in Hyperbole in Book Reviewing appear on Fridays except in weeks when no praise went far enough over the top to qualify. John Updike has died of lung cancer at the age of 76. This is a re-publication of an earlier post about his work. Murder in Mesopotamia: A Hercule Poirot Mystery. By Agatha Christie. Black Dog & Leventhal, 284 pp., $12. Agatha Christie once cleaned ancient relics with cold cream while accompanying her second husband, an archaeologist, on a dig at Nineveh. The technique, she said, was excellent for “coaxing dirt out of crevices” without harming the artifacts. Christie made that comment in her autobiography. But she also drew on her travels in Iraq for Murder in Mesopotamia, which involves the death of the wife of an archaeologist who is leading a dig at a site a day and a half’s journey from Baghdad. No one has any idea who might have killed the lovely Louise Leidner until the Belgian detective Hercule Poirot – who happens to be in the region — turns up at the house where the crew is staying and begins asking questions. That’s more of a boast than a fact, but Christie does give you a kind of Cliffs Notes to her physical and psychological landscape. Leatheran expected something grand from an Assyrian palace: “But would you believe it, there was nothing to see but mud! Dirty mud walls about two feet high – and that’s all there was to it.” Christie’s characterizations of people are just as skimpy and, at times, stereotypical. They spring from a view of “human nature” – a recurring phrase — that is more cynical than is fashionable in our age of “positive psychology.” A character in Murder in Mesopotamia says: “They seemed like a happy family – which is really surprising when one considers what human nature is!” That spirit is no less apparent in books that about Christie’s other detective, Miss Jane Marple. But Christie’s observations about character can be surprisingly modern and astute. Poirot grounds his search for Louise Leidner’s killer in his belief that “the state of mind of a community is always directly due to the influence of the man at the top.” If this is an oversimplification, it is one that has become a pillar of 21st-century corporate management. And it helps to explain why Christie’s novels still appeal more than two decades after her death in 1976. Worst line: A doctor says that Amy Leatheran is “a woman of 35 of erect, confident bearing.” Leatheran describes herself as 32. It’s unclear whether the discrepancy is a mistake or meant to suggest that one character was unreliable witness. Furthermore: The Black Dog & Leventhal imprint of Workman www.workman.com publishes attractive hardcover editions of Christie’s mysteries in an easy-on-the-eyes font at the unusually reasonable price of $12 per book. The titles in its series include Murder on the Orient Express, Murder at the Vicarage, The ABC Murders, A Murder Is Announced and A Caribbean Mystery.